When we lived in Sydney we loved to drive west out on the M4 for about an hour to the Blue Mountains – so named because of the blue haze created by the gum trees. This weekend I have been travelling around the Nilgiri hills in western Tamil Nadu (almost into Kerala). You can imagine my surprise when Jabez told me that Nilgiri means ‘blue mountains’ because of the gum trees! There were several views that were strongly evocative of Australia. 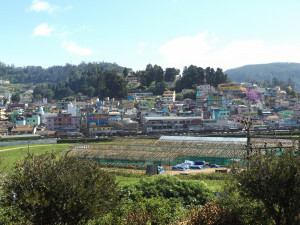 So it is much cooler up here as we visited various aspects of the IBT ministry – including going to Doddabetta, the highest peak in Southern India. IBT is working with most of the people groups up here. 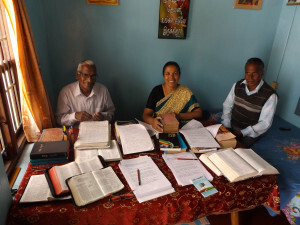 I met with people involved with Bible translation with the (largest group) Badaga, Toda and Kota people. They have maintained their own languages because they are quite distinct from the main Indian nation. They look quite different to most Indians – I thought the Toda were South American from how they look and dress. And, significantly, they are very different in their religious expression. Unlike Hindus none of these three groups have any idols. I think that most anthropologists would classify them as animists. However, they do have a word that they use in their worship which sounds a lot like ‘Jehovah’. One common theory is that they were originally semitic people who lived in the Middle East and emigrated to India thousands of years ago. Now, to be fair to Modi and the BJP, it was the British who encouraged this way of classifying religion. In fact the modern coherent classification of Hinduism as a world religion really only came about while the British were in India. Until then Indians practised all sorts of different things across the country and the British wanted to politically unite and organise India according to (in their eyes) monolithic (and probably assuming monotheistic) religions. So it was the British who first said that if you lived in India and you weren’t a Christian, Muslim, Buddhist, or Sikh (not sure about Jains) then you must be a Hindu. What I have seen on this trip is how often governments use religion for political control. In Sri Lanka Monks riot at the suggestion that it is possible to be a patriotic Sri Lankan and not be Buddhist. Here, in India, Prime Minister Modi is even more upfront that to be Indian is to be Hindu. Recently the news has been full of stories of the ‘gau rakshaks’ (literally ‘cow saviours’) – those people who inform the police about anyone illegally slaughtering cows – in some states it is illegal to kill cows. Vigilantes sometimes attack those involved in skinning cattle or selling beef. Of course these people tend to be Dalits (lowest caste who have to do the job) or Muslims. Today the Prime Minister at last denounced the vigilantes, but only mentioned the terrible treatment of Dalits, he said nothing about Muslims. That is because at least Dalits are Hindus. His widespread support comes from Hindu nationalists who love to repeat the mantra that proper Indians are proper Hindus. So while all the hot air hangs over Delhi, here in the blue mountains people who are not really Hindus, are being told the good news of Jesus. But even here the nationalist agenda brings fear and vigilante gangs. IBT faces a lot of opposition to their ministry. Recently Mrs Selvam (the wife of the founder of IBT) was part of a visit to a Kota village. They were giving out gospels in Kota and preaching the gospel. At which point a gang of angry young men drove them out of the village. Even though they are more animists than Hindus they have bought into the BJP propaganda. One little woman. She is not wealthy and doesn’t even possess a laptop which she could take to Coimbatore for checking. And yet I pray that through this one woman the Lord will start to grow his kingdom among the Kota people. This is not about cultural imperialism. I am glad that Baptists have always stood for the freedom of religion. My prayer is that all the people of the blue mountains will have the freedom to hear about Jesus and make their own mind about him.